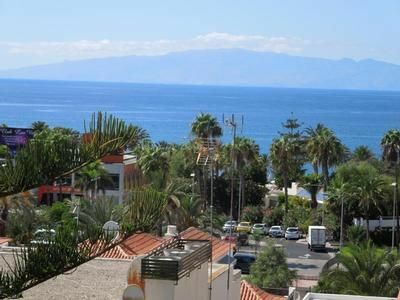 The apartment Casa Tropical is located right in the heart of Playa de las Americas in a very central location. All shops, supermarkets, restaurants and bars are within walking distance. The apartment is on the fourth floor (top floor) and offers a beautiful view to the sea. On a clear day you can see the neighboring island of La Gomera. Internet is available via free wireless internet access. The fully equipped kitchen has an electric cooker, microwave, kettle, fridge and freezer, toaster and coffee maker. The apartment offers plenty of space for a large family or two couples. Two bedrooms have a double bed, another room has a single bed. For 6th and 7th person has the sofa bed in the living room sleep. The cozy living room has a flat-screen TV with satellite channels (all German programs are received). The bathroom has a shower with shower screen and a mirror cabinet with hairdryer. There is also a washing machine and an iron. A seating area provides a 'fast' breakfast located in the kitchen, another sitting area on the balcony. The balcony is covered and the sliding window can be opened. In a niche of the covered balcony, incidentally, is the single bed - many of our guests enjoy falling asleep there and to look at the sea. The pool area is located almost directly below the apartment. The apartment Casa Tropical is located in the south of Tenerife, in the heart of Playa de las Américas, only two minutes from the beach and water sports facilities, a gorgeous place with an average annual temperature of 29 ° C, ideal for beach holidays and relaxing. 18 km from Tenerife South Airport and 1 km from Golf Las Américas. The apartment is located in a quiet and family system that is ideal for a holiday on the beach and has a fantastic view of the sea. The neighboring island of La Gomera is sometimes seen very well. The beach is just a few steps away. Playa de las Américas is the capital of tourists in Tenerife. The now grown city is laid out as a holiday resort seaside village that belongs administratively to the municipality of Arona. The city is located in the southwest of the island and with its sheltered bays provides an ideal holiday destination for swimmers, Strandtourstisten, athletes and active vacationers of all kinds. But it is also an ideal resort for people who want to see and experience something despite the rest. Playa de las Américas, together with the neighboring towns seamlessly Los Cristianos, Playa de Fanabe, La Caleta and Costa Adeje one of the most important tourist centers in Spain. The entire city's economy is primarily designed for the needs of tourists. There you will find everything you need for a carefree vacation needs, such as restaurants, bars, nightclubs, hotels, supermarkets, sports fields, tennis courts, surfing schools, diving, fitness clubs, car rentals, travel agencies and many opportunities for walkers and beach lovers. In 1966, the foundation of the city was declared and the boom of tourism in Tenerife led in the next few years, that the city was growing well developed. The city is also for trips and tours on the island is the ideal starting point because the South Highway connects all the important points on Tenerife with each other. The beach promenade, which begins and ends in Los Cristianos to La Caleta is now over 16 kilometers long. Along the beach you will find a variety of shops, restaurant and shops.